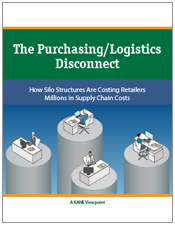 Retailers today have an opportunity to reduce millions of dollars in costs, simply by fixing a structural flaw built into most retail supply chains - inefficient inbound transportation. The problem is that large retailers have thousands of suppliers, each managing its own transportation to the exact same retail DCs. The opportunity is for the retailer to take a proactive role in changing ordering processes so that they receive consolidated inbound transportation shipments, on a set schedule, in fewer, fuller loads. When suppliers are in charge of their own transportation, many smaller shippers must use costlier, less predictable LTL shipments. These loads can arrive at the retailer's DC in ill-timed clusters, causing jam-ups at the loading dock, delays and excess labor to receive the goods. Suppliers build in the cost of this freight inefficiency to the rates they charge retailers. So, even though retailers may not pay directly for inbound freight, they do ultimately pay. The root of the problem is that the retailer buyers, the people who order the goods and arrange delivery times, don't coordinate with the company's logistics team, the people who receive and process the goods at the DC and get it out to the stores. Buyers are primarily rewarded for buying at the cheapest price. They don't much care how many trucks show up at the dock or what's loaded on each truck. On the warehouse side, they are rewarded for efficiently handling the pallets they receive and getting it to stores on time. They are not necessarily focused on inefficiencies on the inbound transportation side because that's not something they control. Here's how this lack of internal coordination is driving costs up for everyone. Labor costs. Poorly coordinated inbound shipments can result in crowded docks and unpredictable volumes. Scheduling the right number of associates for the right hours is very difficult. You could be caught short or have to pay overtime rates. Carrying costs. Because they can't be sure when supplier-managed LTL shipments will arrive, retailers need to tie up cash in extra safety stock inventory. Hidden product costs. No matter how good a deal the buyer negotiates, retailers are probably paying a premium since the cost of inefficient inbound transportation and fuel surcharges are built into the product costs. Environmental costs. When suppliers control inbound transportation, it takes more trucks to deliver the goods than if retail buyers coordinated to consolidate these inbound shipments. To make collaboration a priority at retailers, incentives will have to change. Shared, company-wide objectives will have to trump traditional departmental objectives and rewards. To measure the cost of a product, retailers must consider the whole cost: the price they pay suppliers and all the money it takes to move that product from factory to store. When retail purchasing and retail logistics departments combine forces to push this number down, everyone wins. We write about it more in our paper "The Purchasing-Logistics Disconnect."